Potato gratin is a notoriously heavy side dish, laden with cream and gooey cheese. We wanted to shift the focus of this classic side dish to the potatoes. We chose Yukon Gold potatoes for their rich flavor and moderate starch content, which helped them hold their shape when cooked. Adjust oven rack to upper-middle position, and heat oven to 400 degrees. Grease 13- by 9-inch baking dish. Combine Pecorino, 3 tablespoons oil, panko and 1/2 teaspoon pepper in bowl; set aside. Heat 2 tablespoons oil in 12-inch skillet over medium heat until shimmering. Add onions, 1/2 teaspoon salt and 1/4 teaspoon pepper, and cook, stirring frequently, until browned, about 15 minutes. Add garlic and 1/2 teaspoon thyme, and cook until fragrant, about 30 seconds. Add 1/4 cup broth, and cook until nearly evaporated, scraping up any browned bits, about 2 minutes. Remove from heat; set aside. Toss potatoes, remaining 3 tablespoons oil, 1 teaspoon salt, 1/2 teaspoon pepper and remaining 1/2 teaspoon thyme together in bowl. Arrange half of potatoes in prepared dish, spread onion mixture in even layer over potatoes, and distribute remaining potatoes over onions. Pour remaining 3/4 cup broth over potatoes. Cover dish tightly with aluminum foil, and bake for 1 hour. 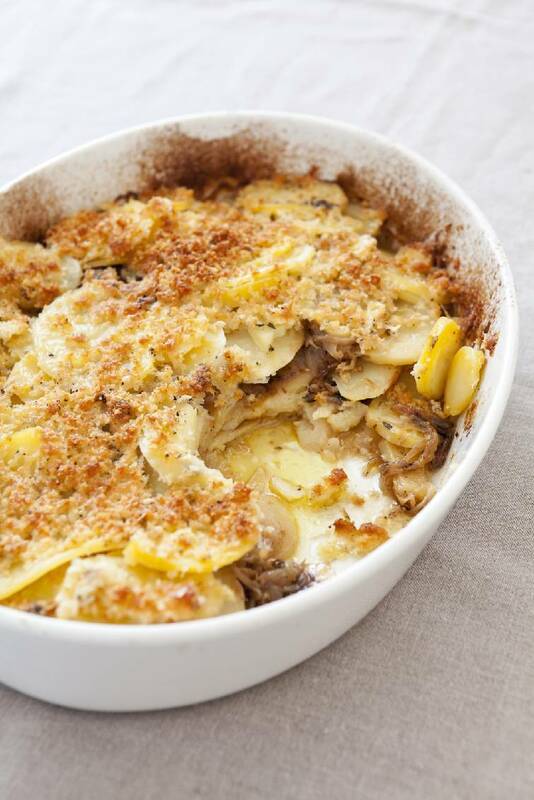 Remove foil, top gratin with reserved Pecorino mixture, and continue to bake until top is golden brown and potatoes are completely tender, 15 to 20 minutes. Let cool for 15 minutes. Serve. Nutrition information per serving: 313 calories; 160 calories from fat; 18 grams fat (5 grams saturated; 0 grams trans fats); 15 milligrams cholesterol; 545 milligrams sodium; 30 grams carbohydrate; 3 grams fiber; 4 grams sugar; 11 grams protein.